Got back to the mountains this weekend to check out a couple trails near a tourist-heavy stretch of the Blue Ridge Parkway. 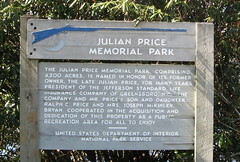 Where I ended up: Julian Price Memorial Park, just up the road from Grandfather Mountain. 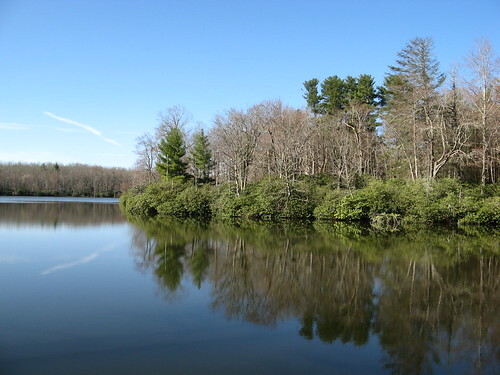 The Parkway splits the park in two — the smaller southern section consists primarily of Price Lake, which has a scenic, flat 2.5-mile trail around its shoreline (wheelchair accessible for about half the route). 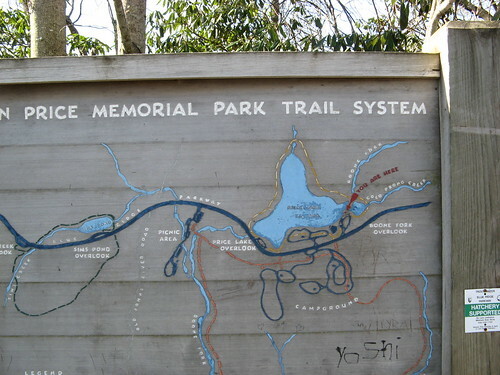 The bigger, northern section includes a bunch of campsites and the moderate, 5-mile Boone Fork Loop. Summer and fall weekends no doubt invite massive throngs to the park, but the springtime crowds are pretty scant. Photo ops are abundant on both sides, but timing is essential. Ambitious shutterbugs who hit Price Lake for a cloudless sunup can bring home stunning reflection shots when the lake is platter-flat. The eastern half of the Boone Fork Loop has abundant falling-water scenes that require cloudy skies and a tripod to snag those cool time-exposure blur shots. I got there early enough to score some passable shots of Price Lake; it was way too sunny capture the essence of Boone Fork but I’d have to be about three times more geeky about photography to complain. Weather was perfect for hiking — upper 40s to start, warming to the 60s by lunchtime, topping out around 70 as I was finishing up. None of the gale-force winds that blast these slopes most of the year. Price Lake from the parking lot near the lake’s spillway. 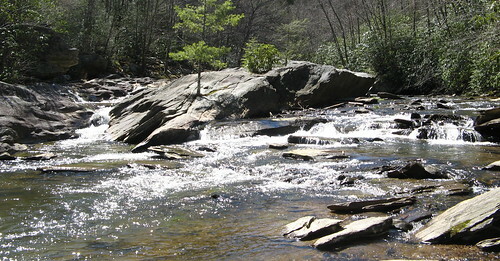 Boone Fork flows downhill into the northern section of the park. Trail boards are very handy. There’s another short hike down the road I’ll have to try next time I’m up this way. Buds of spring sprouting along the lake shore. 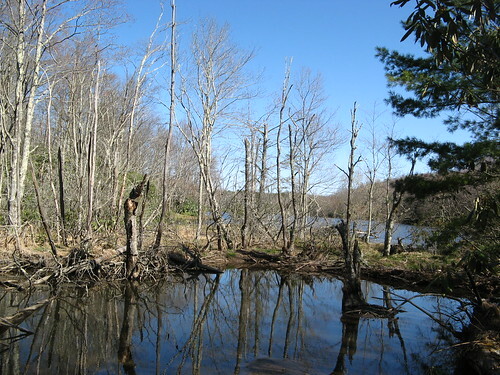 Beavers have been reintroduced to the park after they were trapped out of existence in the late 1800s. They immediately started building dams and creating ponds, bogs and swamps like this little section of backwater. Many nearby tree stumps have that distinct pencil-sharpener appearance that only beavers can leave behind. Beavers are curiously indifferent to human desires for dry trails and proper drainage (or perhaps vengeful for all those years of beaver hats), so consternation is bound to accompany their construction projects. The swamps they create, however, make wonderful homes for a host of reptiles, amphibians and insects, none of whom are complaining. That’s Grandfather Mountain down the road. The easy lake route warmed me up for some more serious hiking across the road. I could’ve walked over but I wasn’t sure about where to cross and find the Boone Fork Trail, so I drove about a quarter mile back down the Parkway to the Picnic Area and parked near a sign pointing to the trail. 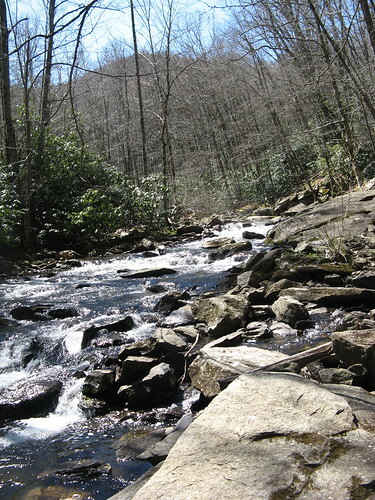 The trailhead offers two choices: north (and downhill) along the Boone Fork, or west through campgrounds, up to a grassy meadow and then diving sharply along a stream and returning for an uphill hike for about two miles along Boone Fork. I took the northern route, which seemed superior to me because there’s nice scenery and easy walking pretty much the whole way; the western route goes through campgrounds for nearly a mile and is pretty light on scenic splendor. Beaver handiwork along the Boone Fork. One of many immense rocks. Boone Fork widens here, with water crashing down the hillside. Ambitious shutterbugs can find all sorts of nooks and crannies along the main trail to get down next to the water. I like the shadow of the nearby hill forming behind the tree canopy. It’ll be invisible by this time next month, no doubt. North Fork Loop bottoms out after about two miles, then climbs sharply for about a mile and a half. 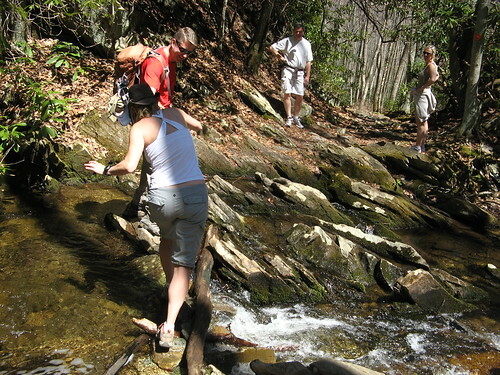 About a half-dozen stream crossings are required along the way. Hikers pick their way across. 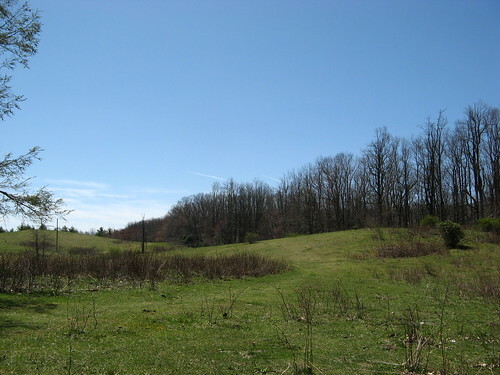 Eventually the trail tops out at a broad green meadow. Grandfather Mountain becomes visible just up the trail from here, but I figured I’ve shown enough pictures of that peak. From here the last mile is a relaxing downhill jaunt passing through a bunch of campsites (still closed for the season as of this writing). 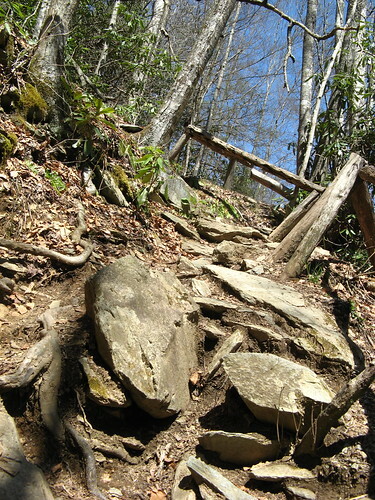 I was pleasantly surprised by the quality of the hiking this close to the Blue Ridge Parkway. The picnic and parking areas nearest the road had plenty of people about, but as is almost always the case, the crowds thin out after the first mile of trail. 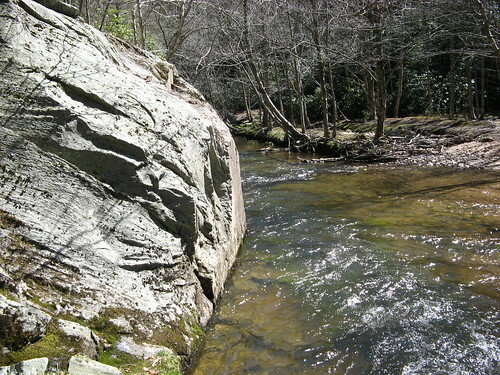 Boone Fork Trail has a nice wild-river vibe in the second mile, heading north from the trailhead. Well worth the two-hour drive up from the flatlands. 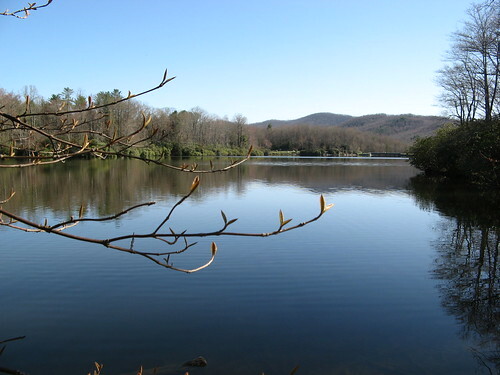 Nice shots, Tom – Boone Fork is very pretty! 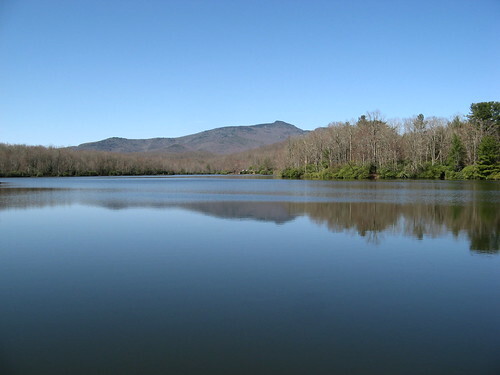 Julian Price Memorial Park isn’t near where I usually hike on the Parkway – I stay West of Asheville – but your pictures look convincing enough for me to make the drive. Tom, you’re in some beautiful country, and you’ve got the photos to prove it.